Phase I: Initial discussion, protocols, history of land and inhabitants, land tenure, institutional analysis (businesses), holistic goal, vision, mission, geopolitical assessment, bioregional delineation, values, objectives, goals, needs, wants, available budgets and monies. 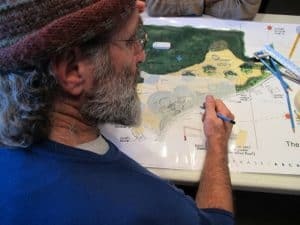 Phase II: Training in methodologies of Permaculture for representatives of all involved in site: those that live and work at and maintain the site (minimum one-day intro to Permaculture methodologies and principles or full PDC). Phase III: On site assessment, abiotic and biotic factors, physical, biological and cultural attributes, landform, built environment, energy sources, present and historical land use features, activity nodes and corridors, critical habitat foundations, soil composition, vegetation composition and cover, successional pattern and plant productivity, wildlife corridors, water resources, climatological factors, the waste stream. Phase IV: Design Charrette with representatives of all those occupying and using the site. 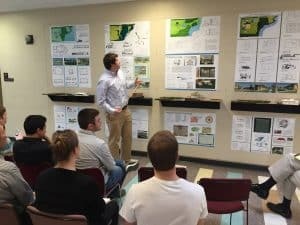 The master plan is a concept map that depicts the needs and ideas of the client, and the designers’ experience in defining what is best for the land and the people that inhabit it. Begins with an intensive design charette (see previous) with all stakeholders involved in the project. Subsequently, the designers review and collate all materials collected and work them into a master plan. This master plan is a precursor to construction drawings and implementation of the project. Looks closely at code requirements, zoning, budget, time lines for future implementation. A narrative and a full set of hand-drawn or CAD drawings created. Timeline for design and implementation. Architects and engineers create a full set of construction drawings, budgets, timelines. We seek out the desired contractors to put the project on the ground. 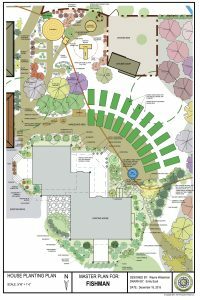 The Permaculture Project LLC and Bio-Culture work closely with the Permaculture Design Build Collaborative LLC in the implementation of master plans. We have several crews that work all around the US. From design to putting these systems on the ground. This precludes the need for a full set of construction drawings, budgets, and timelines.